EcoMax organic neem cake fertilizer is derived from 100% pure high quality Neem Kernels- A tree known for it’s countless benefits. Manufactured using cold rotary processing technology to ensure high bioavailability and Natural status of the neem cake with no addition of steam & chemicals. 100% Vegan based Organic NPK Nutrient (6-1-2) is an OIM & OMRI Certified Organic Input. Also Serves as a great natural fertilizer product. Available in various forms: neem cake powder, neem cake granules and neem cake pellets. EcoMax neem meal acts as a slow release Organic nutrient for maximum crop uptake and soil / crop sustainability. Supports maintenance of acidic soil pH and enhances NPK nutrient plant uptake(notably N&P). Provides rich vegetable proteins and carbs for soil microbes to ensure long term soil health and sustainability. Reduces Nitrification of Nitrogen fertilizers/ leaching and improves N utility & cost economics. Improves soil and plant health with organic carbon and neem ingredients that compliment sustainable crop care. Besides being a vegan Organic NPK nutrient, EcoMax neem cake also supplies natural micro-nutrients in trace amounts. Serves as a standalone use Organic nutrient as well as an ideal combination product for usage with all other NPK nutrients, both Organic and Inorganic. Mitigates odor from Organic manures/ poultry litter in storage, manufacturing & in-field uses. 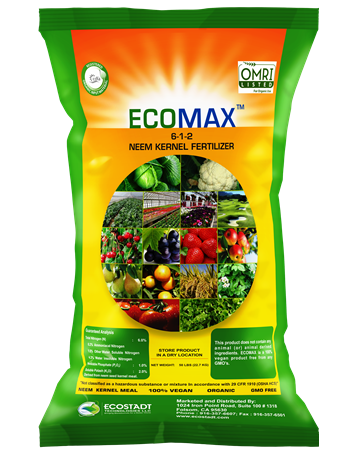 EcoMax Neem Meal is labelled for Usage in Agriculture, Turf, Ornamentals, Greenhouses etc. with easy application directions. The product sales support rural communities via jobs and livelihood in East Asia. Neem is also an excellent carbon sequestration tree source and sales of this product supports overall global ecofriendly effort to reduce atmospheric carbon. Meets Organic and Vegan NPK crop nutrition certifications. Enhances efficiency of nitrogen fertilizers. Enhances soil health by supporting beneficial soil microbe population. Soil Application: 5-10 LB/ 100 ft2 (or) 1/4-1/2 cup per gallon of soil (or) soil less media. Drip Use: 2.5-5.0 LB in a cloth bag in 10 gallons water and apply through sprinkler/ drip use. Soil Application: Apply 20-40 LB/ 1000 ft2 with suitable spreading equipment and irrigate. Drip Use: Soak 10-20 LB of ECOMAX in a bag in 10-20 gallons and apply in sprinkler for 1000 ft2. Soil Application: Apply 1/4 - 1/2 Cup in a gallon of potting soil (or) soil less media. Use 1 cup as high rate of application. Drip Use: Soak ECOMAX 1/4-1/2 Cup in a cloth bag per gallon of water for 24 hours and apply as tea. Drip Use: Soak ECOMAX 0.5-1 LB in cloth bag in 4-8 gallons water and apply tea for 100ft2. Soil Application: Apply 1/2-1 Cup for young trees and 1-2 Cup for mature trees. Drip Use: Soak ECOMAX 1/2-1 Cup/ Gallon of water and apply a tea. Use 1-2 cups for mature trees. Soil Application: Apply 5-10 LB/ 100 ft2 evenly and water adequately. Sprinkler use: Soak ECOMAX 2.5-5.0 LB/ 4-8 Gallons water for 24 hours to make a tea for drench. Recommended for all crops including vegetables, fruit trees, nut trees, row crops, feed and forage crops, ornamental trees, flowers, shrubs, container plants, turf and public greens. © ECOSTADT TECHNOLOGIES LLC . All Rights Reserved.